When you wake up in the morning, drink a glass of water to start the day off fresh. Keep drinking water throughout the day to keep yourself hydrated and your body moving. Daily exercise boosts your energy levels, improves your mood and relieves daily stress that come with work and family life. When you get enough rest, you have more energy to do things that make you happy, especially the next day. Plan your day carefully and tactfully. Every morning, make a list of the 3 tasks you want to accomplish that day. Work on one important task for 50 minutes and then take a 10 minute break to refocus. 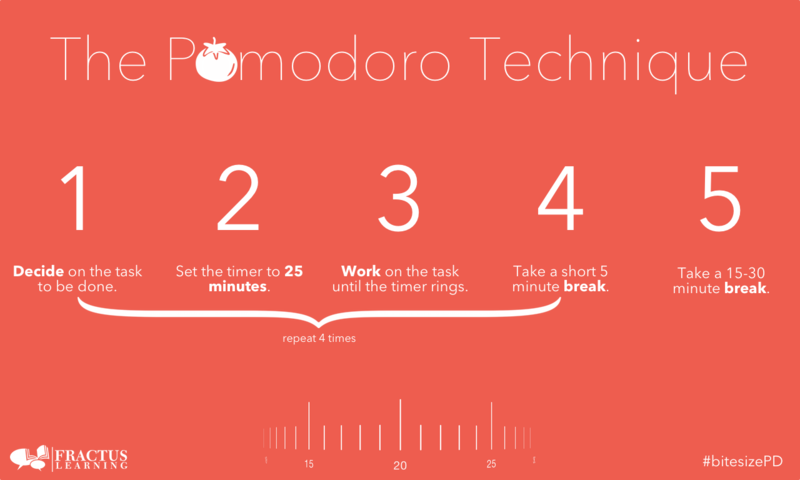 Alternatively, you can try the Pomodoro Technique. See visual below. End your day with a 10 minute reflection and self-evaluation of what you have achieved. Set goals for the next day. Reading increases knowledge, which in turn keeps you inspired. Choose a book you are comfortable reading and are interested in. Breakfast is the most important meal of the day. It gives your brain the freedom of focus that it needs to be creative that day. You can gain a ton of motivation and inspiration by observing those around you. “In my walks, every man I meet is my superior in some way, and in that I learn from him.” – Ralph Waldo Emerson. Arguably, TED Talks could be the best thing to happen to the Internet since the Google search engine. There will be at least one video that will inspire you and change your life for the better. Laughing is often life’s subtle sign of what’s most important, happiness. Write entries in your positive aspect journal or gratitude journal – the process is very good at helping you become motivated and productive.